When cardiac arrest patients cannot successfully be resuscitated by emergency medical services in the field, lifesaving attempts to race them to a nearby hospital via ambulance often prove to be futile. In addition, the effort potentially increases danger to other drivers, pedestrians and the EMS professionals themselves, according to findings reported in the Sept. 24, 2008 issue of the Journal of the American Medical Association. 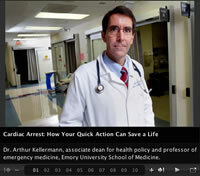 The project and findings, involving researchers from Emory University, the University of Michigan Health System and the Henry Ford Health System in Michigan, were based on the Emory-initiated CARES (Cardiac Arrest Registry to Enhance Survival) Program. The program is a Center for Disease Control and Prevention (CDC) funded surveillance registry, which was designed to help local officials determine how well their community performs in each link of the American Heart Association "Chain of Survival" -- basic steps necessary to properly resuscitate a cardiac arrest patient quickly and safely. For that to happen, however, a series of critical actions must be taken quickly and properly. These include a bystander recognizing the seriousness of the emergency and calling 9-1-1. Secondly, CPR should be promptly started at earliest possible moment -- ideally by a bystander or family member who knows how to give CPR even before an ambulance arrives. The third critical action is defibrillation -- a counter shock that can help the heart stop the quivering action. And the fourth and final key to survival is prompt transportation to a nearby emergency department. If all the right things are done in the field, and a patient's heart cannot be restarted, the study calls into que stion whet her it is fair to ask the paramedics, ambulance crew, family members who might be riding in the ambulance and the public to put their lives at risk, and whether more lives can be saved that way. The bottom line for this study was a resounding no, says McNally. In identifying and weighing the risk to benefit of rapid transport, researchers who analyzed the records of more than 5,500 patients instituted two separate rules called the Basic Life Support (BLS) Rule and the Advanced Life Support (ALS) Rule. These rules were used to help determine which patients would have been transported, or survived, if EMS crews had applied the three-part BLS Rule or five-part ALS rule - both of which were developed by a Canadian team as part of the Ontario Pre-hospital Advanced Life Support study. Under the three part BLS rule, EMS teams would end their resuscitation efforts if: 1) Cardiac arrest occurred before EMS arrived. 2) No defibrillator was used and 3) The EMS team could not get the patient's blood to begin circulating again. All three must apply for resuscitation efforts to be stopped and, according to the study, if ambulance and fire crews had applied the three-part rule, nearly 50 percent of all cardiac arrest patients in the study would not have met the criteria to be transported by ambulance to the hospital, and 2,592 patients would have been pronounced dead at the scene -- potentially saving 1,645 trips to the hospital. Under the ALS Rule, the three criteria from BLS are used, as well as two others: 4) Cardiac arrest had no witnesses at all and 5) No bystander attempted to perform CPR. If the more conservative ALS rule had been applied to the 5,505 cardiac arrest victims in the overall study, nearly 1,200 patients would have been declared dead at the scene -- saving approximately 245 trips to the hospital.